It is a sunny Saturday afternoon in the Philippines, and 10-year-old Jessie Santiago is watching his classmates play basketball. 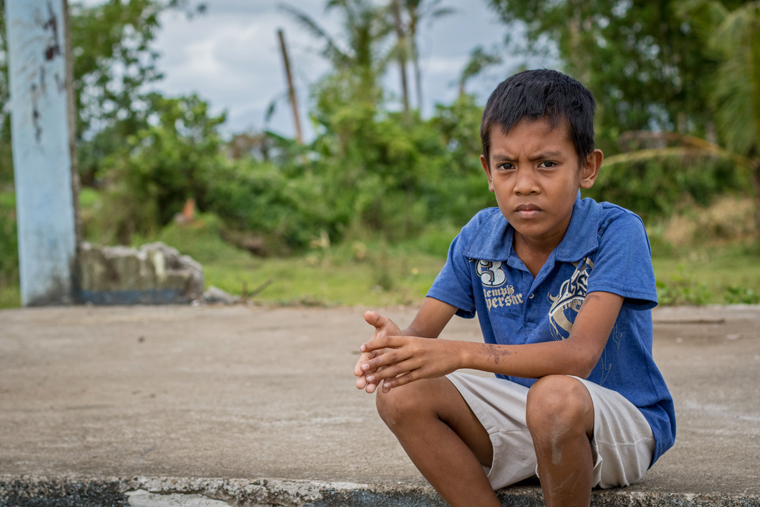 He sits under the twisted steel trusses and broken concrete columns of a playground that was ruined by Typhoon Haiyan more than a year ago. Jessie can’t join in their game because he has schistosomiasis, a parasitic disease widespread in the Philippines. It is contracted by coming in contact with contaminated water. Jessie attends school only two out of every five days due to his poor health. While other boys his age are in Grade 4, he is a year behind in his studies. But on this day, Jessie’s life is changing for the better, as well as that of every other child at Cutay Elementary School. 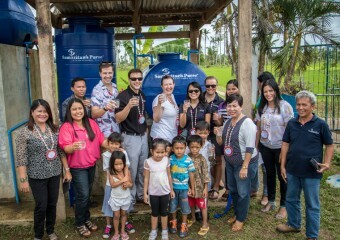 Students, teachers, and representatives from Samaritan’s Purse celebrate the first glasses of potable water filtered at Cutay Elementary School. While the basketball game continues, a ribbon-cutting ceremony is winding down just yards away. Community members have gathered to celebrate the arrival of clean, safe drinking water. A new filtration system, engineered and installed by Samaritan’s Purse, will provide clean water to the school’s 133 students as well as the 756 households in the surrounding community. For Jessie, this means his weak immune system will no longer be subjected to the harmful pathogens in his drinking water. It means he will miss fewer days of school and not fall further behind his classmates. It means he is more likely to play basketball with the other boys, rather than sitting on the sidelines watching. Before the installation of the filtration system, Cutay Elementary School didn’t even have a well. Students had to bring their own water from their homes or nearby community wells, which are often contaminated. Before installation of the BioSand filtration system, students at Cutay Elementary School drank water from nearby wells like this one. 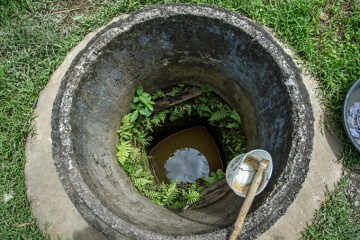 When Samaritan’s Purse began the project, we first dug a well and tested it for pathogens (it was positive for E. coli). We then built the filtration system, designed by the Samaritan’s Purse Philippines staff. The system uses a pump to pull water from the well in order to treat it before distribution through the taps. It requires minimal electricity, no chemicals for purification, and is a sustainable source of clean water. This solution is ideal for communities with limited resources like Cutay. The system uses a large-scale version of the BioSand filter, which typically is used for households. It consists of a drum filled with a layer of fine sand atop a small layer of coarse sand and gravel. As the water passes through, the fine sand helps remove cloudiness, odor, taste, and harmful microorganisms. By the time the water reaches the layers of coarse sand and gravel at the bottom, 95 to 99 per cent of contaminants have been eliminated. The filtration system will help keep children like Jessie from waterborne illnesses. Filtered water is then stored in a 1,000-liter tank, ready to be dispensed through one of five taps or to the group hand-washing station below. The arrival of clean, safe water at Jessie’s school will help prevent the spread of waterborne diseases like schistosomiasis. Students are now free to learn and play without worrying about being thirsty and getting sick. Up to six students are able to wash their hands with clean water in the hand-washing station adjoining the Samaritan’s Purse-designed system. 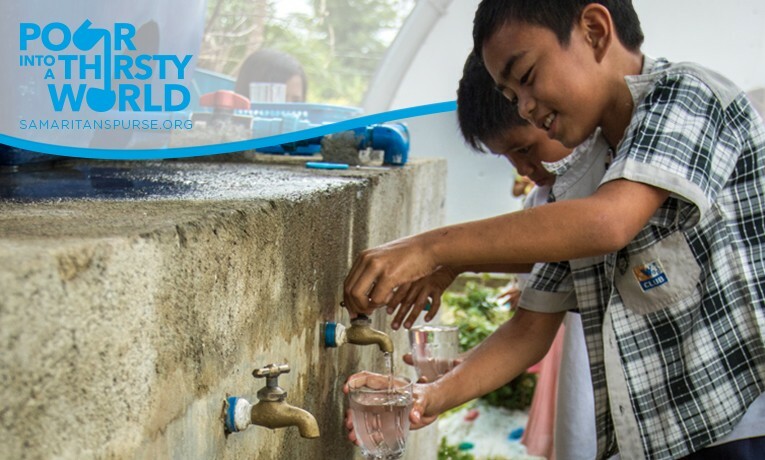 Cutay Elementary School is one of 145 schools in the Philippines that will gain access to clean water this year through Samaritan’s Purse. We are working to install over 50 filtration systems, ensuring that more than 25,000 students and their families have safe, clean drinking water. Samaritan’s Purse has been meeting needs in the Philippines since Typhoon Haiyan—the strongest storm ever recorded to make landfall—devastated the country in November 2013. Clean water provision has been one of our top priorities, and we thank God for allowing us to bring safe, clean water to more than 165,000 people.